The lifting of sanctions against Iran by the United States and Europe could introduce a new commercial and political balance in the Middle East, namely in Syria. When it comes to the resolution of the Syrian conflict, Turkey and Iran, historical rivals in the region, are on opposite positions. While Ankara has worked for some time on overthrowing Syrian president Bashar al Assad, Tehran, in line with Russia, moves in the opposite direction. Turkey, moreover, is in disagreement with the United States because of Washington's collaboration with the Kurdish Democratic Party (PYD) in the fight against ISIL, but is also part of the anti Islamic State (ISIL) coalition. Since July, it allowed Washington to use the Incirlik military air base for its air strikes against ISIL. While tensions with Moscow have risen, after Turkish aviation shot down a Russian military jet on 24 November, in the recent confrontation between Iran and Saudi Arabia after the execution in Riyadh of Shia Sheikh Nimr al-Nimr, Turkey tried to maintain a position of balance between the two Islamic powers. A position emphasized by the Minister of Foreign Affairs, Mevlut Çavuşoğlu, last week. "The tension between Saudi Arabia and Iran has the potential to deepen the problems already existing in our region. It is therefore important to act sensibly and leave the doors to diplomacy open. The region does not need new conflict, but agreement and collaboration. Turkey is ready to take any action to overcome problems between the two countries", he said. Since the beginning of the civil war in Syria, the policy of the Turkish government has been to favor the Sunni Muslim side. "Turkey supported a government with a Muslim Brotherhood majority. When this failed, an unspoken alliance was established with Saudi Arabia and Qatar," wrote the journalist Ceyda Karan. "The Turkish Middle Eastern policy has been taken hostage by Syria. Consequently Turkey has befriended countries whose policies agree with those of Ankara in Syria, and made enemies of all the others," maintained Alptekin Dursunoğlu of Yakin Doğu Haber Middle East news portal. Now, many think that Ankara's alliance with Riyadh, just when Iran is entering a new economic and political phase, could drag Turkey into a dangerous situation, affected by religious sectarianism. The change of leadership in Saudi Arabia, in January 2015, has led to a new configuration of the Sunni power in the Middle East. Turkish President, Recep Tayyip Erdoğan, visited King Salman bin Abdul-Aziz al Saud three times in one year, giving his support to the Saudi military campaign in Yemen. At the end of December both countries, considering "the critical period the region was crossing" and their "brotherhood, friendship and strategic partnership", have agreed the formation of a "superior council for strategic cooperation". An agreement which held major significance when Erdoğan, returning from Riyadh, said that Turkey and Israel, an historic enemy of Iran, "need" each other. This announcement came after a much discussed preliminary agreement was reached in mid-December to renew diplomatic ties between the two countries, interrupted in 2010 after the military assault by Israeli military on the Turkish ship Mavi Marmara. 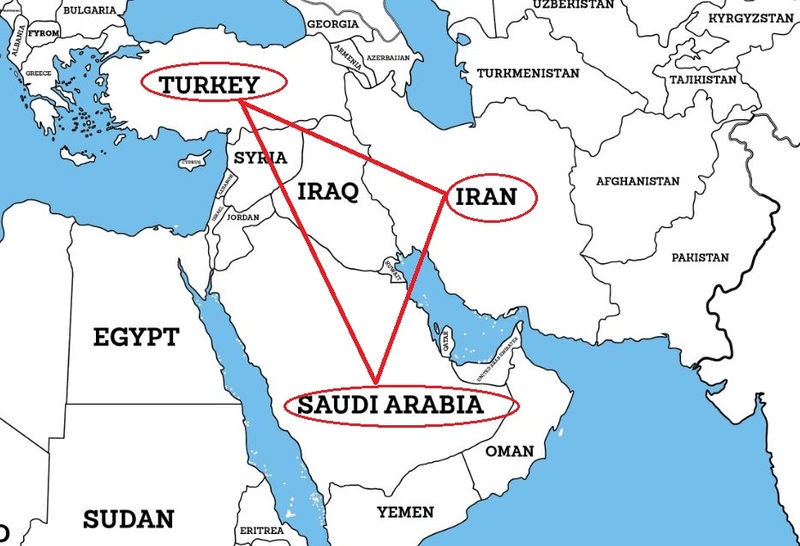 According to the analyst Cengiz Çandar, however, “if Erdoğan's approaching of King Salman was aimed at increasing cooperation in solving regional issues, then the Saudi-Iranian crisis has complicated Turkey's regional plans, especially those in Syria". The military efforts of Riyadh to put pressure on Tehran don't seem to have produced the desired effect. Nor did the attempt to diplomatically isolate Iran, in the wake of the attacks and protests made against Saudi representatives after Sheikh Nimr al-Nimr was condemned to death. Despite being difficult, relations between Ankara and Tehran should necessarily remain of mutual understanding, for the sake of economic and commercial interest above all. Iran is the second country after Russia from which Turkey buys natural gas, which covers almost 20 percent of its energy consumption. After the crisis with Russia, Turkey is exploring new alternative suppliers, even though interruption of supply of natural gas from Russia (64 percent of Ankara's requirement) does not seem imminent. The most optimistic forecast believes that the positive effect of lifting sanctions on the Iranian economy will as also be felt in Turkey. The volume of trade and the amount of oil bought by Ankara is expected to rise. In the past, about half its requirements came from Iran; under the sanctions, the oil import from Iran went down to about 31 percent. The new opening to Iran could have positive effects on the building industry, which has been in serious difficulties for some years in the Middle East. The slowdown in the sector in Libya, Iraq and Russia would encourage entrepreneurs to look for Iranian projects. According to the local press the first contacts have already been made four months ago. "Turkey has been close to Iran during the period of the sanctions with about 200 companies investing in various sectors', says Bilgin Aygül, chairman of the Turkish-Iranian Labour Council. He foresees a turnover between the two countries to reach $30 billion within a few years. Could an increase in Iran's influence become a disadvantage for Turkey? According to Ahmet Kasım Han, of the Research centre for economy and foreign policy (EDAM), it depends on the decisions Ankara will make. Han believes that Turkey could become important to Tehran for delivering natural gas towards Europe, and adds that "there is no doubt Iran will be more self confident in the region. In Syria as in Yemen, however, rivalry between Turkey and Iran will be inevitable, although I think it will be a 'controllable tension' unless they decide to stay only on one side. Maintaining their position in Syria, taking a position against Iran in Iraq, openly supporting Saudi Arabia... It will all depend on which decisions are made", says the analyst.